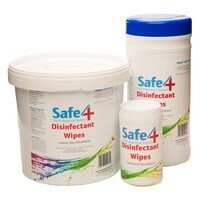 Safe4 Disinfectant Disinfecting Wipes are extremely high quality cleaning wipes that are chosen by hospitals, veterinary surgeons, top breeders and animal charities and sanctuaries. Made without harmful phenols, aldehydes or alcohol, these disinfecting wipes have a neutral pH of 7.6 so that they are non-toxic, non-corrosive and non-irritant. Effective disinfecting wipes that are safe with animal contact and make cleaning a hassle free process! My last order for these are not up to the standard of previous orders.The sheets are wound in such a way we cannot pull them up through the hole and they are not very moist.